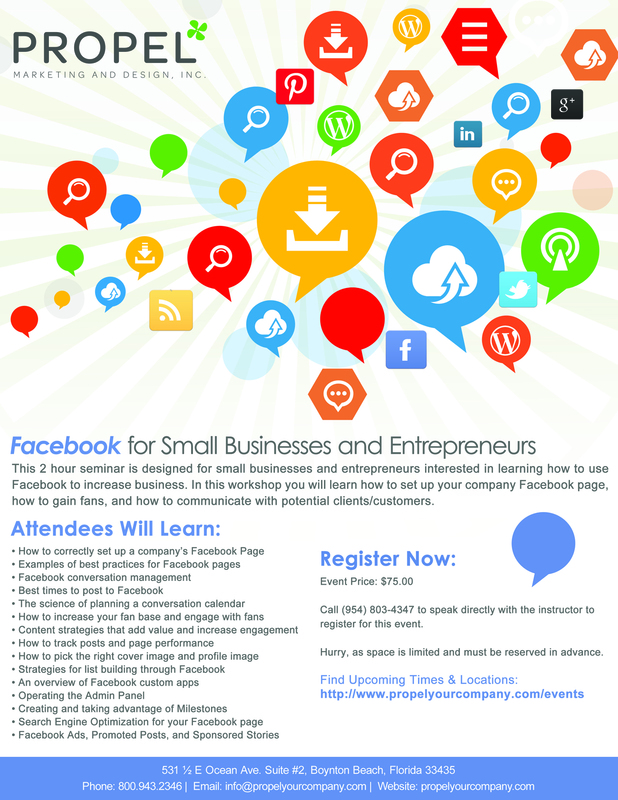 Propel Marketing & Design, Inc., a Boynton Beach based Marketing Agency, just released their South Florida Small Business and Entrepreneur Web Marketing and Social Media Workshop Schedule for July 2014. These workshops will offer intense, comprehensive, and fun material to participants, covering all the bases one needs to start up or take an internet business to the next level. They are designed for professionals looking to effectively leverage the latest digital communication technologies. Classes cover applications and resources available online to improve their organization's reputation, interaction with potential customers, and drive more traffic to their websites. Internet Marketing Boot Camp is a four hour comprehensive workshop designed for small businesses, entrepreneurs, and marketing personnel interested in mastering the basics and advanced strategies for Internet Marketing. In this workshop participants will learn practical tips they can start using today to build a powerful and recognizable online brand. Search Engine Optimization: Be Seen, Rank Higher, and Sell More is a four hour workshop designed for small businesses, entrepreneurs, web designers, and marketing personnel. Participants will learn how to rank higher in search engines. The class will discuss what tools to use to perform a keyword analysis, how and where to work keyword phrases into websites for maximum results, and how to get incoming links to help increase search engine visibility. 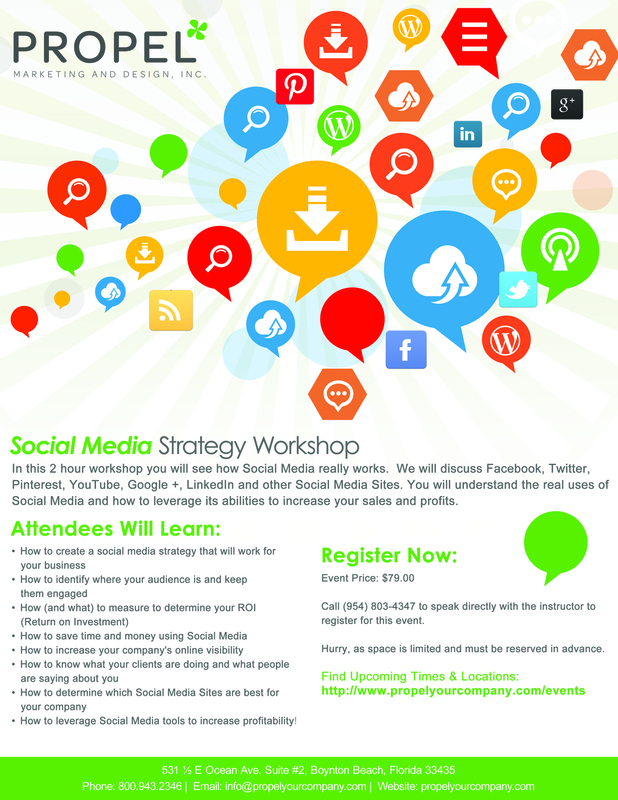 Social Media Strategy Workshop is a two hour seminar. The class will discuss Facebook, Twitter, Pinterest, YouTube, Google +, LinkedIn and other Social Media Sites. After completing the workshop, participants will understand the real uses of Social Media and how to leverage its abilities to increase their sales and profits. Learn the Basics of WordPress is a two hour class designed for people interested in mastering the basics of WordPress. In this workshop participants will learn how to use WordPress to create and manage their website. 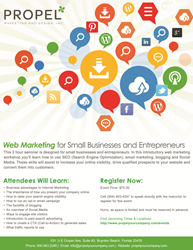 Web Marketing for Small Business and Entrepreneurs is a two hour seminar designed for small businesses and entrepreneurs. In this introductory web marketing workshop participants will learn how to use SEO (Search Engine Optimization), email marketing, blogging and Social Media. These skills assist to increase online visibility, drive qualified prospects to a company’s website and convert them into customers. Registration is required in advance and space is limited. To find out more information about the classes listed here, visit http://www.propelyourcompany.com/events or call (800) 943-2346. Propel Marketing & Design, Inc. is a full-service internet marketing agency, located in Boynton Beach, Florida, that specializes in SEO (Search Engine Optimization), social media, website design, email campaigns, search engine marketing, public relations, graphic design, and marketing workshops. Propel works with clients to create effective and unique marketing strategies to help raise their online profile and support their business objectives. For more information please visit http://www.propelyourcompany.com.